Notre condo en bord de mer est idéal pour quiconque veut une maison loin de chez eux. Le condo a été rénové en 2014 et a tous les nouveaux meubles, etc. La véranda entoure le coin de l'unité et a des volets électroniques. La cuisine vous permet également de cuisiner comme s'il s'agissait de votre maison. Les deux chambres ont une télévision. Vous pouvez profiter de la vue magnifique sur Lover's Key et regarder les dauphins majestueux dans les eaux du Golfe tout en vous relaxant sur votre véranda. Restaurants. les magasins et les activités sont nombreux sur la plage et dans les communautés voisines de Bonita Beach, Bonita, Naples au sud et Fort. Myers et Sanibel au nord. Notre condo est personnellement pris en charge par nous ..... c'est les propriétaires! Mots-clés: Condo Unité de coin en bord de mer avec de superbes levers et couchers de soleil. Vues du col de San Carlos et du golfe du Mexique. Wonderful unit! We have stayed in many different units at Carlos Pointe. This is by far the nicest. It was well appointed, very comfortable and had everything we needed from the kitchen equipment to the beach chairs and beach umbrella. Wonderful stay. As frequent travelers we have stayed in dozens on condo over the years, and this was, without question was the best. Great location on the beach, beautifully decorated with great waterfront views. Very few of the places we have stayed provided more than the basic kitchen items, and usually required buying condiments and other related items. There was nothing lacking here and had everything we could possibly need. The owner, Irma was responsive and very helpful, which made our stay even more enjoyable. Thanks for the review Joe! We appreciate you taking the time to write. We are always happy when our guests feel that our condo provides a comfortable stay. My wife and I stayed in this beautiful condo in Fort Myers beach for our anniversary. We had a great time and thoroughly enjoyed the space. It was immaculately kept and beautifully decorated. The owners were attentive and actually live in the same building. The condo was beautifully decorated, the furniture was very comfortable. 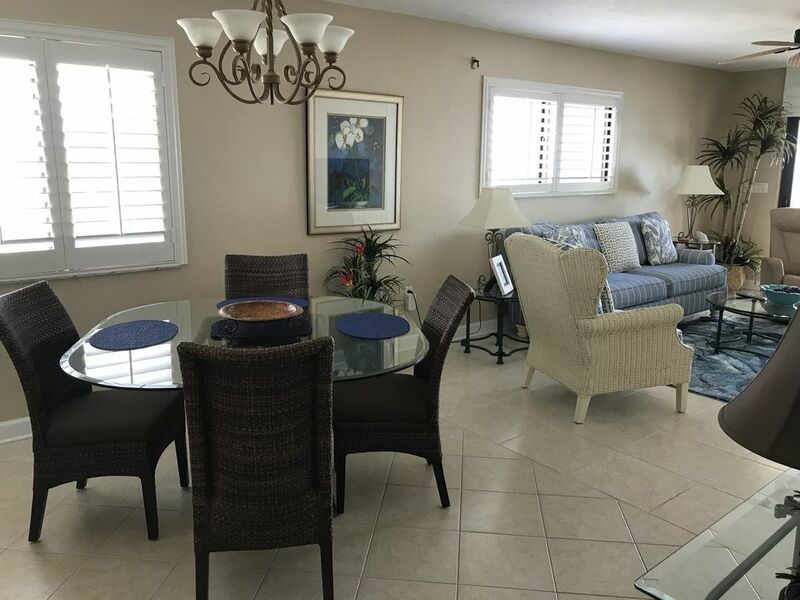 It is a corner unit with a spacious lanai where we had our morning coffee and rested in the evenings after some great days on the beaches. There were wonderful attractions and restaurants within a few miles, but it was just enough away from the attractions to be quiet when we were resting. The rental rate was reasonable for all this condo offers. We had a great week at Nonna's and look forward to returning again some time. Thank you so much for your kind words! We are happy that you enjoyed our little piece of paradise. Happy Anniversary! My best friend Holly and I had a very relaxing week at your condo. We loved how beautifully decorated, comfortable and clean that it was. Thank you so much for checking in with us the first evening to make sure we had everything we needed and that everything was as we had expected it to be. Every evening on your lanai enjoying the view and the most incredible sunsets was just amazing. Irma you went beyond the call of duty to make sure our stay was perfect. We will absolutely be back. Thank you so much for everything. The unit is very tastefully decorated. The owners obviously treat this unit as their home, and not just an investment. We have ented many different units at Carlos Pointe, and this by far was the nicest!!!!! It was my first experience of NOT running out to pick up some gadget or doo-dad to use during our stay. Can we say FULLY equipped. Irma was a pleasure to work with, and called us to make sure that everything was perfect! WOW! This unit is on our "repeat" list.